I’ve been using the Android G1 smartphone as my main device for several days now and during that time my main complaint has been the poor battery life. 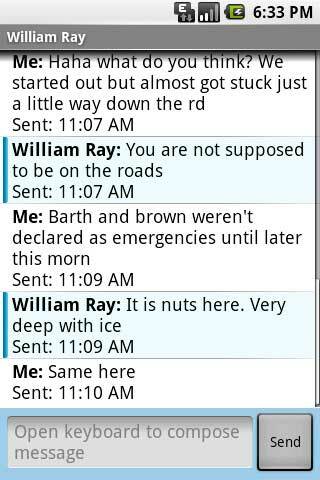 But the last two days have brought up another issue that could be a deal breaker for me. First and foremost, the Android G1 is a phone. It might be a smartphone that has all kinds of extra whiz bang features, but if you can’t make and receive phone calls with it, then it’s pretty much a useless device in my opinion. The first bummer that I encountered was learning that the voice dialing feature that is included on regular T-mobile G1’s is not available on the dev phone. I’ve searched around in the Android Market, but haven’t found a replacement. Anyone know how to get voice dialing functionality on the dev phone? Is it a T-mobile only program? Without that feature, you still have several ways that you can dial a number. By pressing the Green phone button, it will take you into phone application. Inside that app, there are four tabs. The app remembers which tab you were on last and will take you there again when you press the Green phone button. 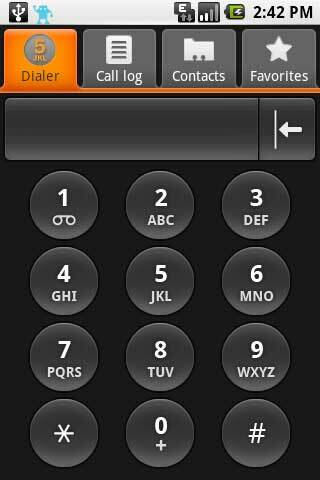 The Dialer tab has a finger friendly keypad layout that you can use to dial individual numbers. After you’ve typed in the desired number, you have to press the Green phone button to make the call. 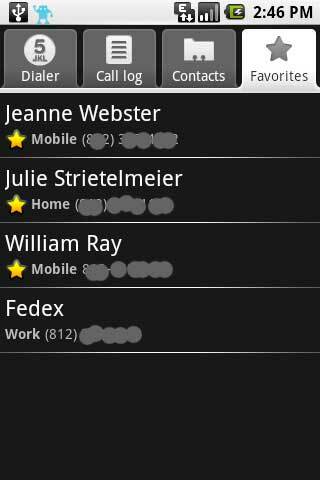 The Call Log tab shows you a list of recently dialed numbers. From this list, you can tap an entry to dial the number. 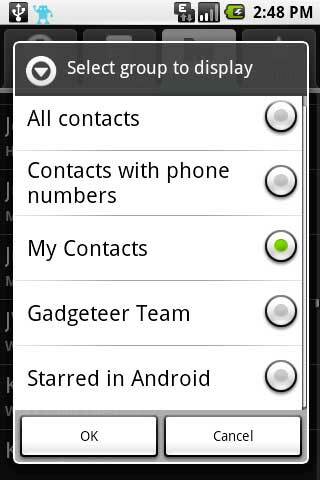 The Contacts tab gives you a scrollable list of all your contacts. 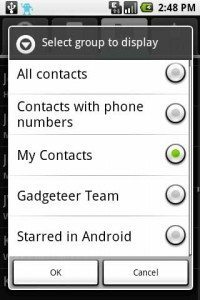 If you have the keyboard open, you can type names to filter the list or you can press the menu button to show different subsets of your contacts. When a call comes in to your phone, it will show a screen like you see above. If your contact has a picture associated with their entry, it will show the picture. Otherwise you will see the cute little android. 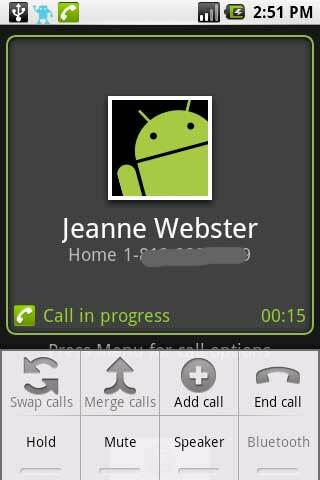 During a call, you can press the Menu button to access features such as the speaker phone, mute, hold, etc. If you happen to miss a call, your only indicator is the White and Red notification icon at top of the display. In the image above, you will see four icons on the Left side. The first one shows that the G1 is connected to a USB cable. The second one is from a Twitter application that I have installed. 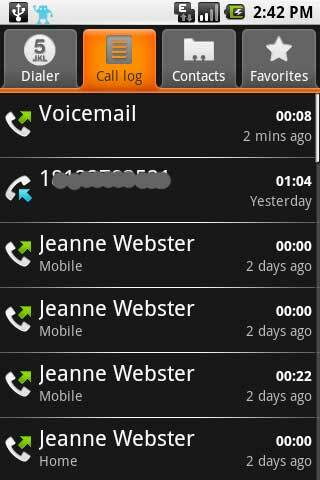 The third one is for a missing call and the fourth one is for a voice mail. You can get more info on these notifications by tapping and pulling down the top bar with your finger. Sort of like pulling down a window shade. Double click the menu button to wake and unlock the phone. Press the Green phone button to launch the phone application. Tap the favorites tab if you’re not already in it. Hold your finger on a favorite. There is a calling short cut that you can use if you remember the last number that you dialed and want to call it again. To do that, you wake up and unlock the phone (double click the menu button) and then double click the Green phone button. It will dial the last number you called. I’m testing the Android G1 on AT&T’s 850Mhz frequency and have found the reception to be only slightly better than my first generation iPhone. What does that mean? It means that it’s nothing to celebrate over. Often when I’m using it in my basement office, I’ll see that it has no bars at all. Sending SMS messages will sometimes result in a network connection failure. I understand that it’s probably not fair to complain that a GSM phone won’t work in a basement, but most Nokia phones that I’ve tested work much better for me. 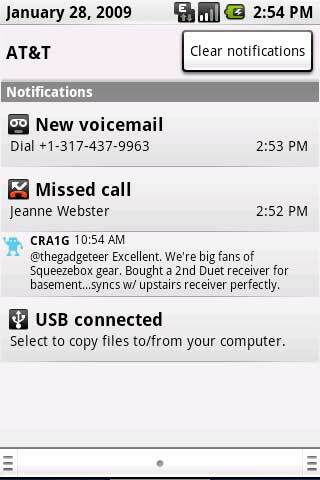 SMS junkies will be happy to know that the G1 does include a decent threaded SMS interface. There is nothing super special about it, but it seems to work well. I tested it by sending messages to people on Verizon and AT&T without any issues. 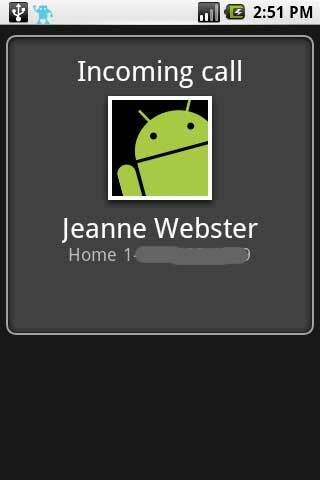 For actual live chatting, there’s a Google Talk client. Although I don’t use Gtalk that much, I do like the fact that if you use it on your phone, you don’t have to disconnect from from a client on your desktop. Messages will come to both places, which I like. There are two email clients. One for non-GMail POP3 and IMAP accounts and then the GMail client. I briefly tested the non-GMail account by setting up my .mac account which I don’t even really use, the client seemed to work as expected. Since I’m a GMail person these days, I have been focusing on that client. 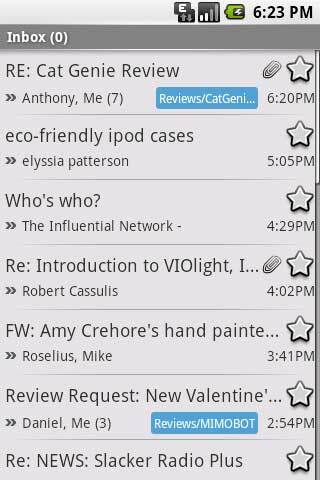 The GMail client feels pretty much like what a mini GMail client would be expected to feel like. 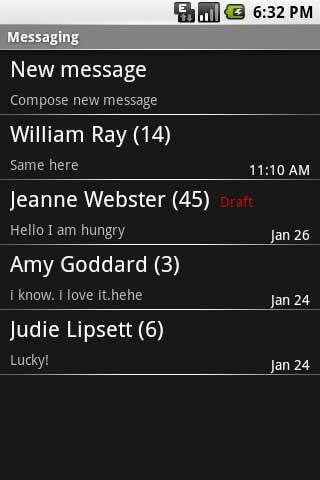 It shows the labels associated with messages, if there are attachments, starred, etc. 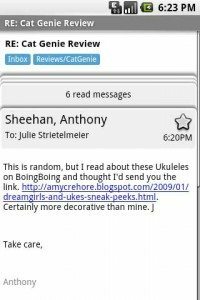 Clicking on the subject line will allow you to view the message. If there are multiple messages from the same person, you will see a stacked view. You can click on the top stack to show a list of all of messages. The one thing that you can’t do is to expand all the messages so that you can read them from start to finish. The GMail client can handle attachments. 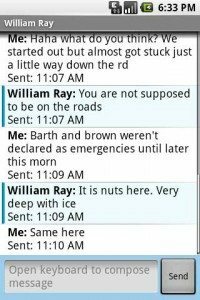 I sent a few test messages with images and PDF files attached. When reading these mails, it will show the icons for the attached files and allow you to click on them to view them. 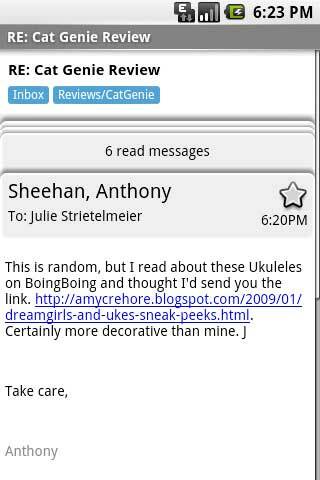 HTML emails with embedded images also works well. You do have to click on a Show Pictures button at the top of the message for it to load any images. The G1 autosyncs every 5 minutes in the background for new mail in your GMail account. It also autosync for changes to your google calendar and contacts, but as far as I can tell, it doesn’t do this as often. There isn’t a way except for disabling autosync to change how often this occurs. This is most likely one of the main reasons why the battery life on the G1 is so poor. Since I’m opting to use the G1 on AT&T’s network, I can’t enjoy 3G speeds. It’s not a big deal to me because I don’t have 3G coverage in my area anyway. After using the Blackberry Storm on EVDO, I’ve been a bit spoiled and have been finding EDGE speeds to be pretty sluggish. It’s nice that the Android G1 has Wifi. Browsing can be done in either landscape or portrait orientation. Landscape is the most comfortable viewing mode though in my opinion because you can use your Right thumb on the scroll ball to scroll around on the page. I’ll admit that I’m spoiled by the browser experience on the iPhone. Being able to zoom the text by using the finger spread gesture, or double tapping text to zoom in is a really easy and fast way to make the browsing quicker and more confortable on such a small screen. The browser on the G1 doesn’t have easy to use features like that. That said, you can go into the settings and change the text size and there are onscreen zoom gadgets. There’s a + and – button that appears on the bottom edge of the display. To use them, you hold your finger on either button to zoom in or out. The problem is that it sometimes does not stop zooming as soon as you lift your finger, so you won’t always get the size you really want. There’s also a crosshairs button in the lower right corner that puts what looks like a magnifier box on the display that you can move around with your finger. I played around with this feature a little, and found that it works erratically and isn’t very useful in my opinion. Images aren’t resized to fit the display as you can see here. There is an option in the settings to format the page to fit the screen, but this only effects the text and not images. You can have multiple open windows (think tabs) too. At the time I’m writing this review, the built in browser doesn’t appear to support Flash. If I try going to Youtube.com with the browser, it won’t play videos. It won’t play videos on CNN.com either. Overall browsing websites on the G1 is not an unpleasant experience. I don’t have any major complaints other than the lack of Flash support. 1. You have the dev adp1 phone, but use it like it’s a consumer grade G1. Most people that have this phone have prob modified the os for dev testing. You should do the same by getting root access, and installing the modified Android os named JF 1.41. 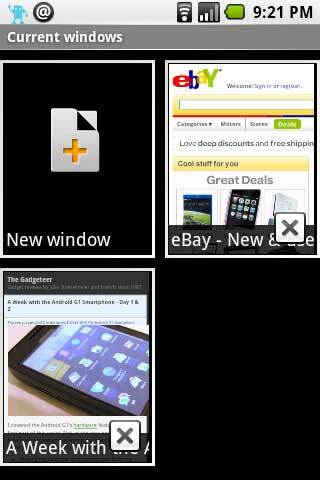 This gives you finger pinch zoom in browser, along with.auto rotate without opening the phone, which is nice. 2. I don’t think you are familiar enough with some of the settings available to save you clicks. Also, if you DL toggle wifi, and toggle GPS from the market, you can turn them off when not needed-thus saving battery life. Also be sure to turn down the brightness, and DL a prog called fastbright from the market. This should help out a bunch! Like the review so far, its interesting to hear someone elses perspective. I think some things are getting a bit confused in your review, and I think your experience could be better. You are referring to your ADP1 dev phone as a G1. They are not the same phone by far, and I don’t think its fair that you are reviewing a dev phone from the standpoint of a very casual user. 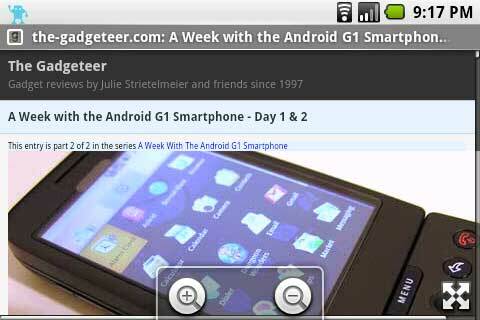 This phone isn’t meant to be a normal G1, thus the signing up to be a developer and all. If you want a better experience on your ADP1, you can visit some developer forums, and gain root access and install a heavily modified (but incredibly brilliant) version of Android OS called “JF 1.41”. This will give you pinch zoom in the browser, and will also give you auto rotate in the browser without having to open and close the phone. There are things you can do to take care of the battery life. Turn off your wifi, and GPS, but DL and install “ToggleWifi”, and “ToggleGPS” from the market, and just create a shortcut on your desktop. Then you can just turn it on/off as needed. Also turn the brightness of the screen down and install “Fastbright” from the market. Then you can turn the screen brighter momentarily but have it revert to the same brightness after your task is done. 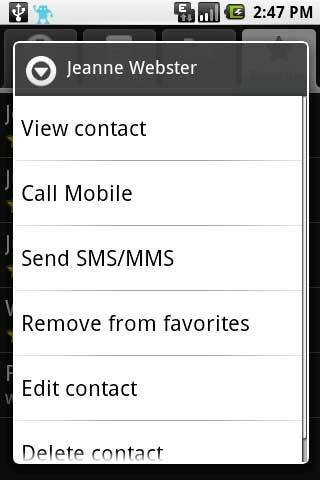 Try creating shortcuts on the desktop for some of your favorite contacts, this will seriously cut the number of clicks. I like the review, it’s nice to see the phone from someone else’s point of view, as I am almost the only one I know that has one. Mod it out, and have some fun with that thing. If not maybe we can trade, as I have a rooted regular consumer G1. @travis: Can you explain how the dev phone differ from the G1 available from T-mobile other than the fact that it is unlocked and has a couple apps (example: voice dialing) missing? I’m reviewing it with an “out of the box” type approach. Hi Julie, thanks for your lovely reviews. 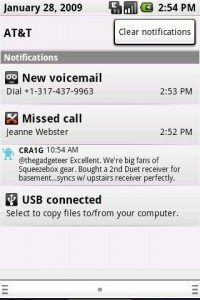 How did you find the multi-tasking on G1, are the background notifications working well? How does this phone compare to against the iPhone please??? Sorry the double post was from submitting the first version of the comment from my phone. I got an error so re-wrote from pc. Sorry. 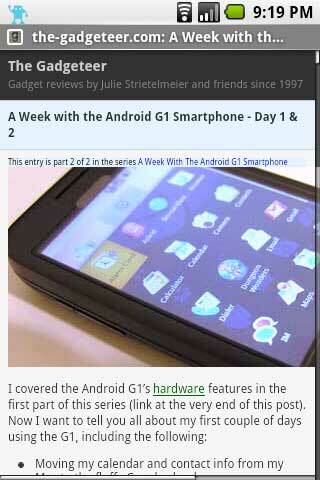 Excellent update, can’t wait for more and this is the most useful Android G1 review I have read. Nothing like getting your real-world experience. Would like to know whether G1 allows you to keep background apps running. Can you play Rhapsody or similar app and play it while you are reading the internets? @Ivan: I know you can put a friend’s contact shortcut on the screen, but when you tap it, it will show their whole record and all their numbers. I’m not seeing how you make a one click call shortcut on the desktop (without installing a 3rd party app). 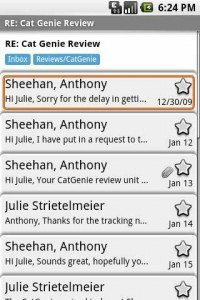 Does the G1 have support for Microsoft Exchange? That’s one of the big reasons I LOVE my iPhone – having my calendar always updated and ready to check is so, so handy. I do like that the G1 has individual call timers in your call log – I’m hoping the next iPhone software update will include that very easy feature. The voice dialing thing probably is T-Mobile specific. I believe that voice dialing requires a remote server of sorts to process your voice, unless (like most iPhone apps) it’s prerecorded on your phone. That being said, there’s a good chance T-Mobile has something like that (could be how Verizon did it for my V325), so it has to be a T-Mobile-issued phone to work. Just a guess. 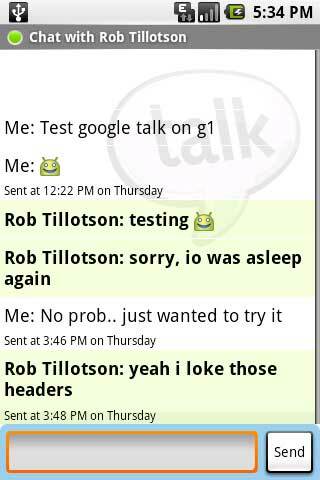 The Gtalk and Gmail clients look nice – of course, since Google played a big part in the development of Android. Can’t wait to see the rest of your take on it! Regarding the quick dialing – I’m using AnyCut (available on the market) to make direct shortcuts to important mobile numbers on my left desktop screen. 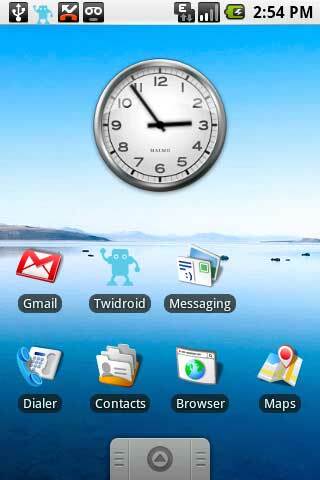 That way I’m able to call my wife and couple of friends just by unlocking the phone and tapping on the icon. Well, thats the thing… why would you use a g1 without installing any of the third party apps? That’s the whole beauty of the phone. They didn’t include many features in the phone just because they knew other people would be able to develop better programs…. which they have. @Travis and Tips: I will be discussing a few 3rd party applications before the end of the review. In my opinion, I always feel that it is best to review a device based on the out of box experience. So many people buy phones and never install a third party application on it. For that fact, if a phone doesn’t work well with its stock set of features, then I think that it’s important for people to know that. ” Q: What is the difference between the G1 and the ADP1 (Android Dev Phone 1)? @Chris Boyle: Yes, I have the Youtube app. I’ll be covering that in the next post when I talk about music, video and the camera. julie, thanks for the depth of your review! i got the g1 not too long ago, and have found it to fit my needs extremely well. i would have found the details you’re conveying illuminating, when i was weighing the choice. there are some places where your info is a little misleading, however, particularly (as travis suggests above) due to your using a vanilla dev version. i can help fill in some of those details. you complaints about the number of actions needed to call are, in fact, pretty much mitigated by the voice dialer. when i call from the car, i put on my bluetooth headset, unlock the phone, and press and hold the green key. i say the name into the headset, and then have to glance at the screen (for the first time in this sequence) to confirm the result. everything except for that glance at the screen can be done tactily. i don’t feel unsafe doing it while driving. about youtube videos – my phone plays them, beautifully. (no other flash content works, however.) my understanding is that this is standard, and i would be surprised if it’s a missing feature on the dev phone. maybe, though, if it fails on your phone. 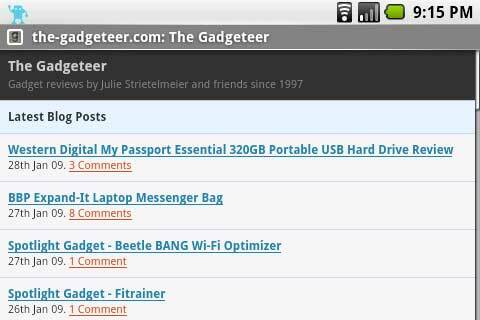 re battery life – someone suggested getting some little toggle apps, for wireless, gps, bluetooth, from the app market, plus screen handling stuff. i agree that you need to resort to the market to handle it, but there’s one slice-bread caliber app, Power Manager, that does the trick automatically, according to your configuration and the current power circumstances (external power vs batter). it extended my battery life dramatically, to the point that i’m comfortable. you also were frustrated with the on-screen browser resize controls, but i haven’t had the same problems. i can get exactly the size i want by tapping the +/- buttons without fuss. i haven’t used an iPhone, though, so haven’t experienced the bliss of multi-touch gestures. there’s actually lots more that substantially enhance, like Weather Bug, ShopSavvy, VisaMobile, etc, but the above fill in some essential gaps. you say being without 3g isn’t a big deal, but in the next sentence complain about EDGE speeds. thing is, this is another consequence of using the phone in an atypical way – it’s kind of amazing that you get all the functionality you do, considering that you’re on a network for which the hardware wasn’t intended. 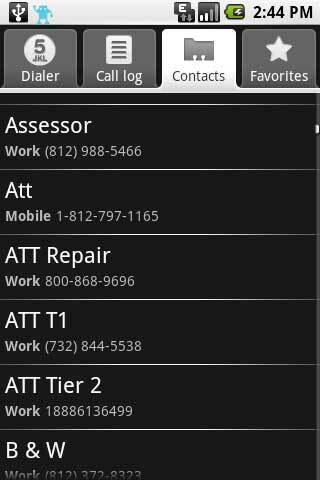 (AT&T uses a different set of frequences for their 3g, as you probably know.) perhaps t-mobile isn’t an option for you, but that’s making a distinct difference in your experience, and that’s worth expressing explicitly as a factor in the review. personally, the combination of android and the google productivity apps settles what’s been a 15 to 20 year pursuit (including various models of the sharp zaurus, other pdas, small computers, etc) for a comprehensive communications tool. one that doesn’t ghettoize my contacts, email, calendar – i want the info available at hand *and* on my desktop, at work, etc, without a lot of fuss. there is zero fuss with the g1, and the high quality of the apps (on computer and mobile device) is delicious icing. hopefully i’m not just a zealot, and the above info is helpful – i can’t recommend the platform enough, and would like to see it thrive. anyway, thanks for your thorough review! @Ken: The odd thing about the lack of the voice dialer is that the little getting started brochure that came with the phone mentions it. Hmmmmm, strange. The Dev phone isn’t missing the Youtube application. I was mostly just commenting on the fact that the built-in browser does not support Flash. So far, I do like the G1. I don’t quite love it though. I think that’s mostly due to the actual hardware design of the phone. It takes a lot for me to fall in love with a phone. Thanks for a great review. The things you mention would be deal breakers for me too. Even though I like gadgets, I want them to work for me without pressing a lot of buttons and wasting time.